For school, work, or evals! The Wheelchair Attachment Set is a “one set fits all” collection of Mount’n Mover wheelchair attachment hardware. The WC-SET includes a solid wheelchair bracket, which combined with the angle adjustment plate should accommodate mounting tilt angle. You have the option to add the Angle Adjustable Wheelchair Bracket (WB), and still benefit from the reduced price of $100. The WC-SET is a perfect complement to the Table Eval Kit, enabling you to assess access needs from wheelchair AND tables. The Table Eval Kit is the “shortcut” for evaluating a Mount’n Mover. This kit is designed for quick, cost effective access evaluations for the vast majority of communication devices, laptops, and even iPads. Designed for clamping to a table for access trials, we include Dual arm Mount’n Mover for the most flexibility and versatility. With the table clamp and the included 18” Post, you can mount above tables in the conventional way, or even below for much shorter evaluations. While this kit does not include any wheelchair mounting options, keep in mind that you can combine this kit with the Wheelchair Attachment Set providing you with almost all of our wheelchair hardware for any mounting need! 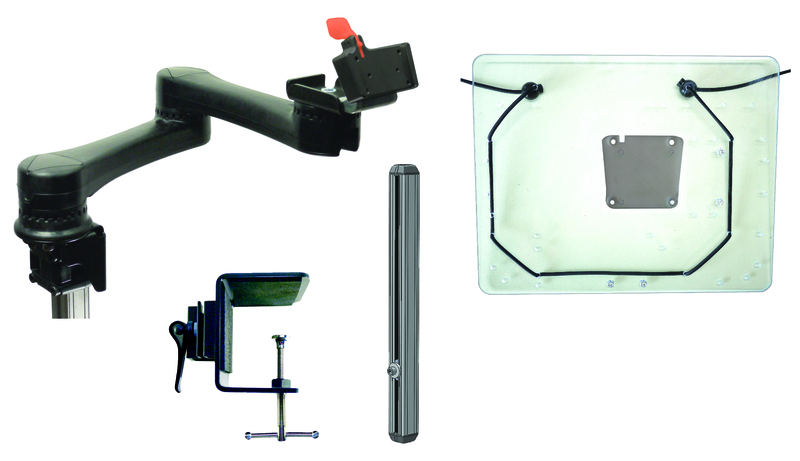 The Mount’n Mover Deluxe Evaluation kit includes everything you would need to fully trial a Mount’n Mover. With the included components, you can potentially mount up to TWO wheelchairs, and utilize the table clamp. The single arm Mount’n Mover is included for evaluations that might not need the flexibility of the dual arm. With the included device and tray attachments, access to virtually any activity can be properly trialed. Encourage access to multiple activities with the included reading tray, iPad tray, and adapters for most communication devices! The entire contents of the Deluxe Evaluation kit come in a durable, hard plastic rolling case. This kit is deeply discounted and designed for evaluation centers to truly give folks a hands-on chance to trial the Mount’n Mover!